While orthodontic treatment can create a wide range of improvement for a patient’s smile and overall oral health, most people are hoping for an aesthetic transformation – particularly straighter, more uniform teeth. However, the thought of having to wear noticeably metal braces for months or even years on end to accomplish this big change can feel like a roadblock, especially for image-conscious teenagers and adults with professional images to maintain. At Cartwright Orthodontics, our team understands these concerns very well, and we can help you find the right alternative for your orthodontic journey. Today, ceramic braces are becoming increasingly popular for younger and older patients alike, providing a more discreet appearance that can keep you smiling confidently throughout the course of treatment. If you’re ready to get started, please contact either our McMurray office or our Bethel Park office today to schedule your first consultation with Dr. Gary Cartwright. Much like traditional braces, the application process will consist of tooth-colored ceramic brackets. The arch wire snaps into the bracket. Over the course of your treatment, the archwire will apply a controlled amount of pressure to the teeth in order to gradually shift them to their desired position. This wire will likely be changed during follow-up appointments. The biggest positive point of choosing ceramic braces is that they’re much less noticeable than their traditional metal counterparts. This means that patients will feel more confident about their orthodontic treatment and be able to carry on with their professional and personal routines as normal. It’s good to know that people are focusing on your smile instead of your braces, after all! 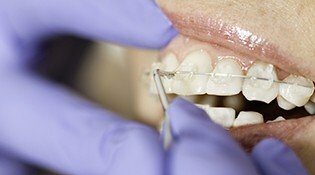 However, ceramic braces also come with some potential disadvantages that patients should keep in mind. For instance, ceramic braces do cost more on average than the metal version. As with any orthodontic approach, it’s very important to discuss all of this information with Dr. Cartwright so that he can help you select the treatment that best fits your unique lifestyle and preferences. We want to give you plenty of reasons to smile! What’s the Difference Between Clear Braces and Clear Aligners? See-through aligners like Simpli 5 or Invisalign do away with the traditional braces system entirely and are more similar to mouthguards; as a result, they’re only capable of creating relatively minor changes for patients in need. Alternatively, clear braces are extremely similar to the original orthodontic model. This means that they can create the same transformative results that metal braces can while helping patients maintain a much more natural and pleasing look.